An ‘astonishingly beautiful’ (The Stage),‘direct and impactful interpretation’ (The Times) of Handel's profound spiritual masterpiece. 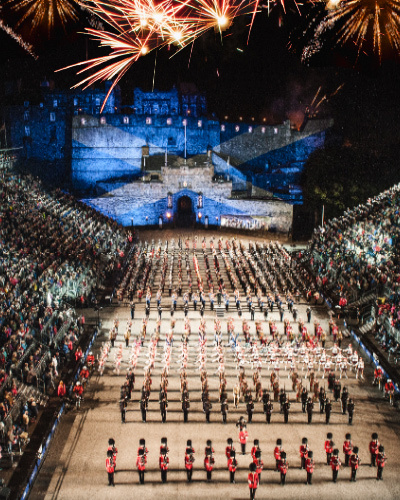 Bringing people together from all over the world, join us for this spectacular showcase of musical tradition as we celeberate the 68th Royal Edinburgh Military Tattoo! A festive celebration, featuring André's never before seen recorded Christmas concert and a live tour of Maastricht + Q&A. The King of Waltz brings his annual summer concert to cinemas - with a special guest, Lou Bega. For the first time ever, one of the world's hottest bands, Imagine Dragons came to cinemas worldwide for one night only. 2015 marked the 11th consecutive year of André Rieu's traditional summer evening concerts. The final concert of Grateful Dead, broadcast to cinemas as delayed live from Soldier Field in Chicago. A very special 10-year anniversary edition of Rieu's annual much-loved summer concert. Legendary singer, songwriter and performer, Elton John performs his critically acclaimed show at Ceasars Palace in Las Vegas. Back by popular demand - André Rieu: Home for Christmas re-released with an added live tour of André's castle. André dazzles the cinema audiences with his annual Maastricht concert. André's spectacular festive concert, Home for Christmas. Fatboy Slim enjoys the biggest cinema dance party in the world with this Big Beach Bootique performance. The King of Waltz returns for another one of his hometown concerts. The only full-length colour documentary of Queen Elizabeth's 1953 coronation, screened in cinemas. Aussie rockers Cold Chisel bring their 2012 Sydney Hordern Pavilion show live to cinemas. Concert film featuring the amazing talents of the guitar virtuoso, Joe Satriani in amazing 3D. Beautiful concert of André and friends, captured live at the Amsterdam Arena. Pete Murray's concert, beamed live to cinemas from Sydney's The Basement. World exclusive red carpet premiere of Short Stack's self-made film. The band's legendary 1991 performance at Seattle's Paramount. For the first time ever, André's hometown concert is screened to cinemas in glorious HD. Classic comic operetta by Gilbert & Sullivan, performed by Opera Australia. 2002 tribute concert at Royal Albert Hall, celebrating the life and music of George Harrison. Documentary featuring never-before-seen footage of Springsteen and the E Street Band. André Rieu's enchanting 2009 Australia Arena Tour performance. A 2009 concert of Songbirds, captured live at Tamworth Country Music Festival.